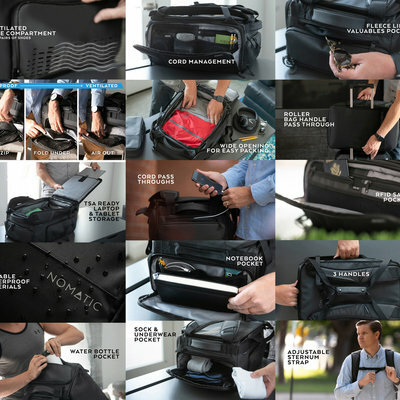 The Spin bag features a roll top that can be customized in a variety of ways and a clever laptop pocket situated in between the wearer's back and the main backpack compartment. Our favorite feature is a zip-off ventilated compartment at the bottom of the bag that can store things like your lunch, dirty clothes and shoes, helping you avoid that gross smell you get when you open your suitcase after a long trip. The compartment can also be removed and washed, so if anything spills or loose dirt sticks to it, you aren't facing the struggle of cleaning a sticky mess later on. In addition to clever compartments, the Spin bag is available in three colors, comes with a removable bungee cord (great for wet items) and is made from a durable TPU coated polyester. There are two sizes of the Spin bag available, 18L and 30L. The larger 30L bag was a little too big for me since I'm only 5 ft 4 in, so if you're on the smaller side I would recommend sizing down to the 18L option. 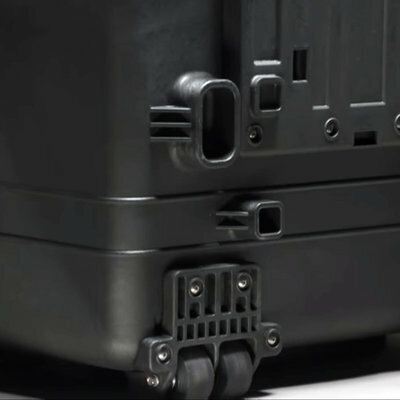 The only noticeable difference besides size is that there is no ventilated pocket on the 18L one. All around, both sizes are solid backpack options, but I would say the 18L one works best for commutes and the 30L one works best for travel purposes. What were you doing before you joined the IAMRUNBOX team? After graduating from design school, I began working with different brands in Sweden, like Gant. I worked at Gant for a short while, and my job was more focused on pattern construction, clothing design and shoes. At the time I was aiming for Paris, high fashion, this and that. That was what I thought I wanted to do, but as time goes by you get other values and meet new people. You travel and get new insights. Gant was founded in New Haven, Connecticut. It was a great job, and everything was good. I was just tired of it, and I was also tired of commuting in the city because by the time I finished commuting, I never had time for anything. It was just a big hassle, it took a lot of time and it was very stressful for me. I also found myself gravitatin g towards gyms because I wanted to try maintain a healthy lifestyle. After awhile, I just decided to start running to work since we had showers at our office. I saved so much time because it was faster to run between my job and my home then to take the bus or sit in the car during traffic jams. I was able to sell my car, quit my metro card and quit my gym card. It was basically the a start of a new life. It was like an aha moment for me. Can it be this easy to commute? Why did you decide to join IAMRUNBOX? I had a lot of time to think and reflect during my runs, and as a result of all this thinking I decided to quit my job. I ended up bumping into Kirill who's the founder of IAMRUNBOX, and he had no idea that I had had this running to work experience. 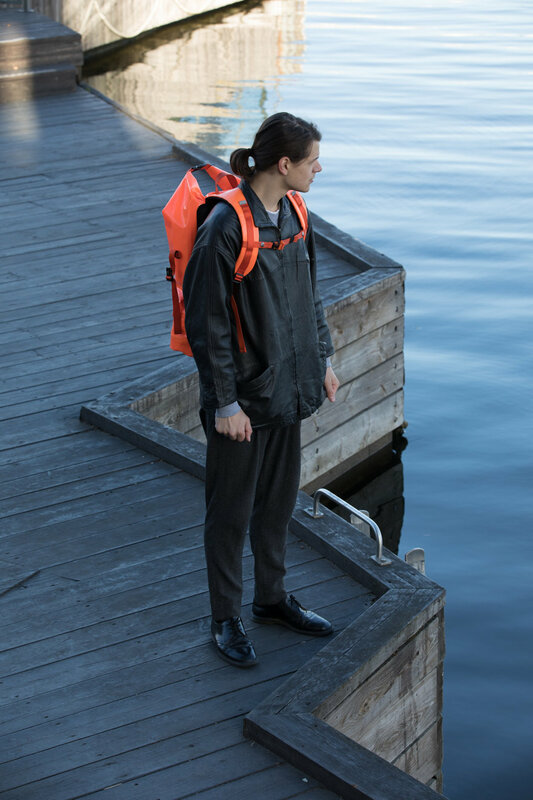 He had already started to develop this lifestyle as the core product offering of this company—the running backpack that can store your laptop, clothes and everyday essentials that you need when you commute. So I joined IAMRUNBOX since I found the idea so interesting, healthy, and futuristic. I decided to try to take the company's design language in a new direction. I still wanted to maintain that active lifestyle, but the Spin bag is just a little bridge between the first products from IAMRUNBOX and what's about to come. We will keep doing a mix between sport and fashion. 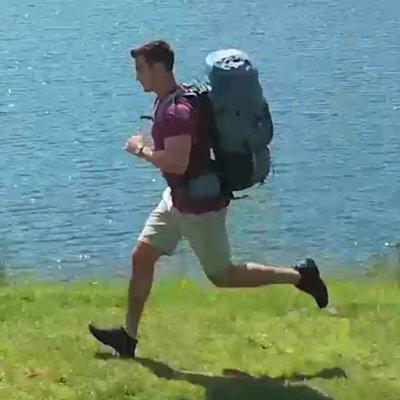 What are some of the main updates you made with the Spin bag, compared to the first IAMRUNBOX backpack? 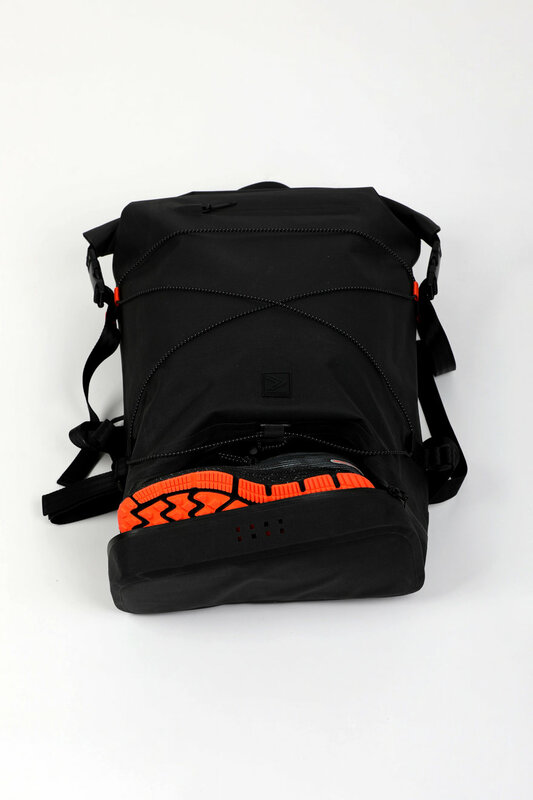 The spin bag, first and above all is not running focused in the same way as the original IAMRUNBOX backpack. You can still run with it, but it's more focused on walking and cycling. We just wanted a super simple backpack. The roll top we came up with is not rocket science—we'd seen it before, but it's overall a popular style and people like it. We all together decided that that was the style we wanted to go for. Then, we had to consider what we didn't like about other similar models on the market. 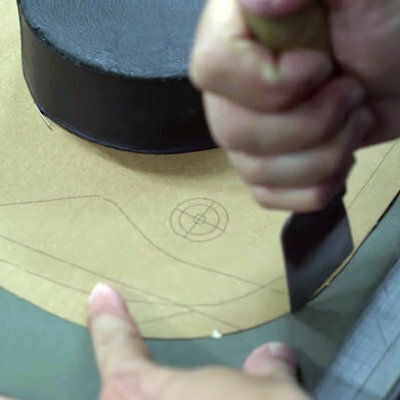 We wanted to find a way to avoid creating too many pockets because so many backpacks nowadays have gotten a bit crazy with pockets. We just wanted essential pockets to make things easier, so we added a simple laptop compartment. It can hold a 15 inch, whereas the old one only holds a 13 inch for now. For the future we're also going to develop pockets that you can add onto and combine with different products. We added the ventilated bottom compartment to the spin bag because a lot of people bring their lunch to work in an extra plastic box. It always leaks and becomes a big hassle. Our ventilated compartment is easy to clean so you can store, for instance, a lunch box there. If it leaks it won't matter because you can wash it. You can also put whatever you want in there. I was swimming the other day and threw my swimwear in there. I didn't bring an extra plastic bag or anything. 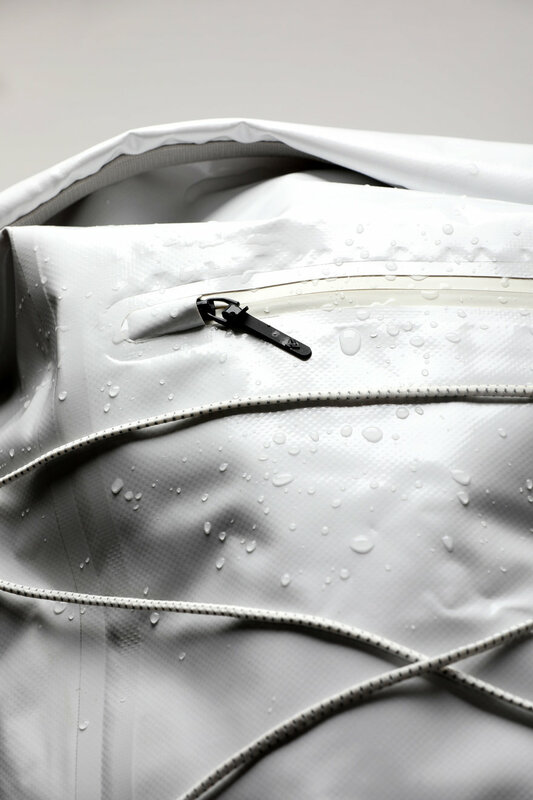 We wanted it to be waterproof and with waterproof-ness you don't get much ventilation, really. So that's at least one little compartment that has that feature. Has it been fun for you to get out of the fashion realm to focus on active bags instead? Yeah, especially since I am an active person myself. For me it's also been fun to visit a lot of factories in China and in Europe. It's very important to me to have a good relationship with our factories and to make sure the workers and the working conditions are good. The better the environment, the better the product, I feel. So, that is something that I love doing and that I care a lot for. It's a very interesting part of all the design work that I do. I get to learn about new techniques and am forced to think in new ways when I design. It's more complicated to create carrying solutions than to construct clothes as well, and I like designing functional objects. It's not what I started out wanting to do, but sometimes you have to think differently than what you're used to. Want a Spin Bag of your own? One lucky Core77 Ultimate Gift Guide winner will receive an IAMRUNBOX Spin bag. Create a gift guide HERE, and you'll be automatically in the running for a Spin Bag and some fun prizes along the way. 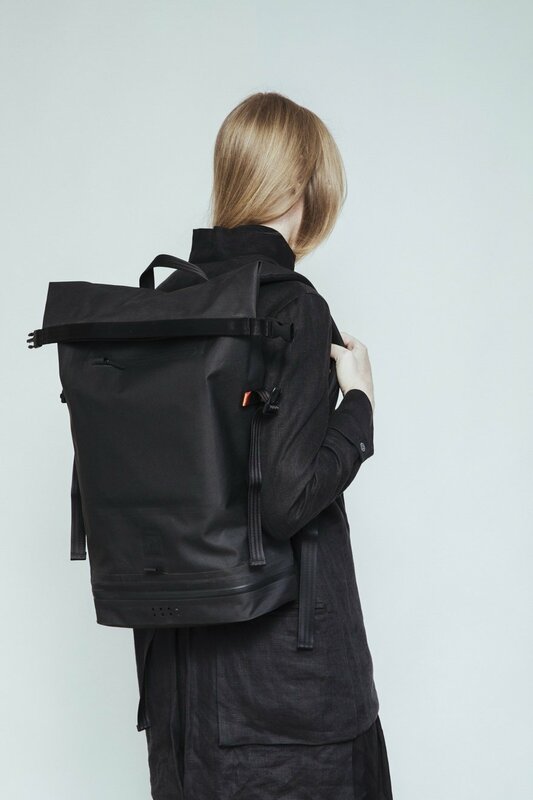 It looks a lot like a Mission Workshop bag you can buy right now without any risk.